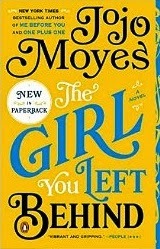 Yesterday I downloaded The Girl You Left Behind by Jojo Moyes. Luckily for me, she's a popular author who sets many of her stories in France. I was surprised that this one is a historical novel set during World War I, which disappointed me, I'd rather have a modern setting, but I'll still read it. I was dreaming of food. Crisp baguettes, the flesh of the bread a virginal white, still steaming from the oven, and ripe cheese, its borders creeping toward the edge of the plate. Grapes and plums, stacked high in bowls, dusky and fragrant, their scent filling the air. I was about to reach out and take one, when my sister stopped me. "Get off," I murmured. "I'm hungry." I could taste that cheese. I was going to have a mouthful of Reblochon, smear it on a hunk of that warm bread, then pop a grape into my mouth. I could already taste the intense sweetness, smell the rich aroma. She wakes up to find the Germans at the house searching for a pig the family is allegedly hiding. I hope it's good. Can't wait to see what everyone else is reading. Obviously, food is a huge draw to France. In France, I eat a lot of things that I might not at home. American foie gras? I don't think so. I'm not even likely to eat lamb or duck when I'm in the United States, but those are my go-to meals when I'm in France. But my all time favorite thing to eat when I'm in France is salad with goat cheese. 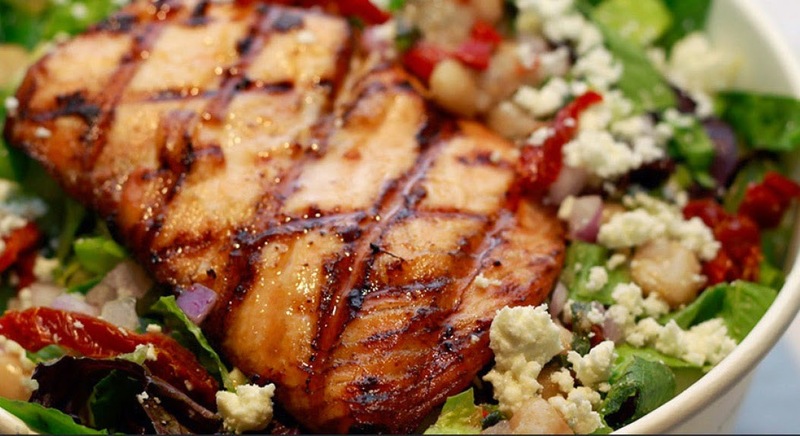 Usually, the salads have little pieces of toast with rounds of goat cheese on them. If I'm careful in my bite calculations, I can have a bit of toast and goat cheese with each bite of salad. This salad had three separate kinds of goat cheese and I forgot to take a picture until I had eaten half of it. This salad in Marseille had wedges of deep-fried goat cheese. Luckily, I found goat cheese salads pretty much everywhere we went. How bout you? Is there something that you look forward to eating in France? 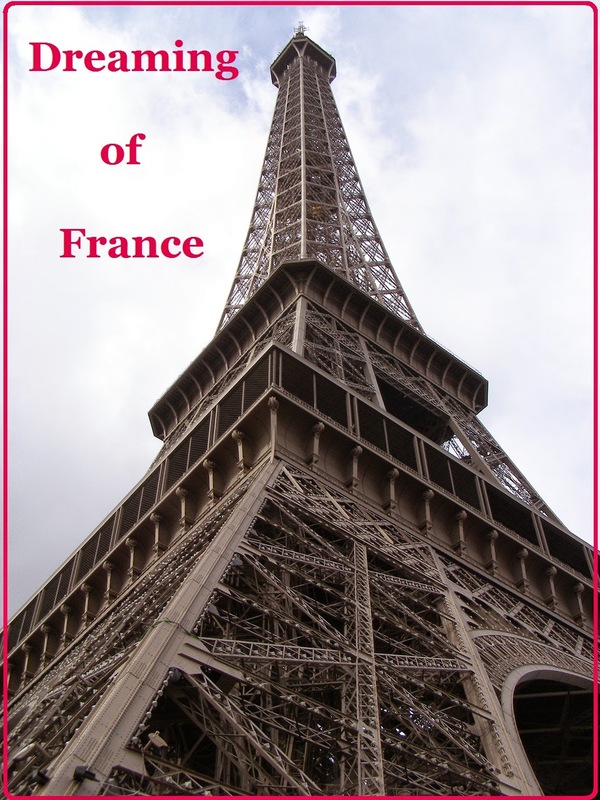 Please leave a comment and visit each other's blogs to share more about your love for France. Kisses are so confusing in France. Of course, if you're a tourist and you're visiting France without knowing anyone, you may never have to figure out the French kiss. But if you have friends, you're going to have to kiss cheeks at some point. On this, my 11th trip to France, I am just as confused as I ever was. We landed in Paris and zipped down to Aix en Provence on the TGV, the very fast train. A blogging friend, Delana, picked us up at the train station. Exchanging kisses with her and her French boyfriend, we started on the left side then the right side. It felt a little off to me, but I figured I'd forgotten how to do cheek kisses since the last time we were there. Each time we met with Patrick and Delana, we'd exchange two cheek kisses beginning on the left side. So imagine my surprise when we got off the train in Paris and my friend Michel was waiting. He gave three kisses, but beginning on the right side. Since Aix is in the south of France, I figured maybe they had picked up on Italian customs of kissing on the left side first. They start on the opposite side in Italy. 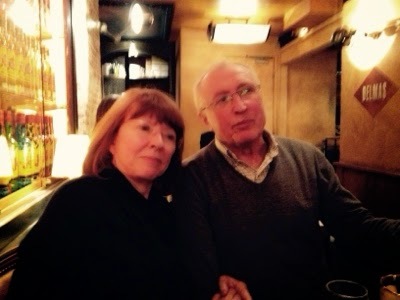 My confusion only grew when we met with blogging friend Linda and her French husband Maurice. Linda and I just hugged; we're both American. But Maurice kissed my cheeks and announced, "Four times" so at least I knew how many kisses were expected. How's an American traveler supposed to keep track? Two kisses, three kisses, four kisses? Left side or right side? I've decided to be a passive kisser and just follow the lead of whoever begins the kissing. It's much easier than trying to figure it out, bumping noses or kissing air when the kisses don't continue. Hope your life if filled with kisses today! While enjoying the good life in France, I was also on alert for things which would seem strange to us as Americans. 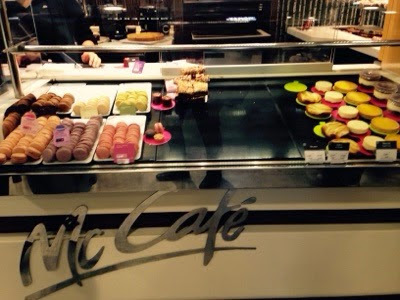 I found one as I passed a McDonalds at Les Halle's, an underground shopping mall connected to a Metro stop. There I saw a display for macaroons at McDonalds. I paused for a moment to take a photo and to wonder who would eat McDonalds macaroons when so many wonderful patisserie shops were available. Tonight, we watched the sunset on our vacation. We fly home in the morning. We've had a lovely visit soaking up the culture along with eating and drinking our way through cities. 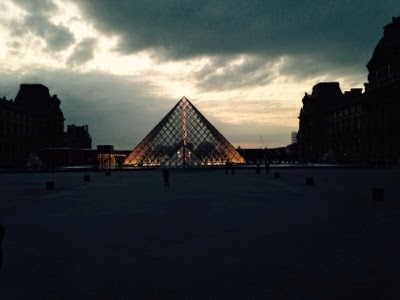 I lucked onto a lovely photo as the evening fell near the Louvre. The clouds look dramatic and the pyramid at the Louvre is lovely lit up. 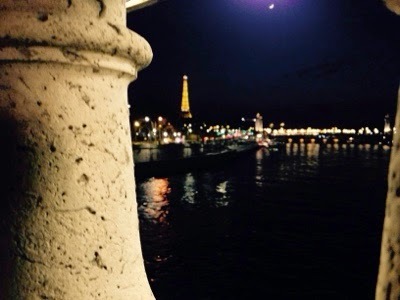 And then, while we waited for the Eiffel Tower to sparkle, I knelt down and took a shot through the pillars of the bridge. Which bridge, you may ask? I never could keep them straight. The one near the Obelisk. You can see a sliver of the moon at the top of the photo. Venus was shining just above it too. Thanks for playing along with Dreaming of France. I have cameras full of more photos I can use for Dreaming of France and some interesting stories to tell too. I hope you'll come back and join me. Please visit each other's blogs and leave a comment below. We are so fortunate to have friends who live in France. Nearly every trip, we manage to connect with them. 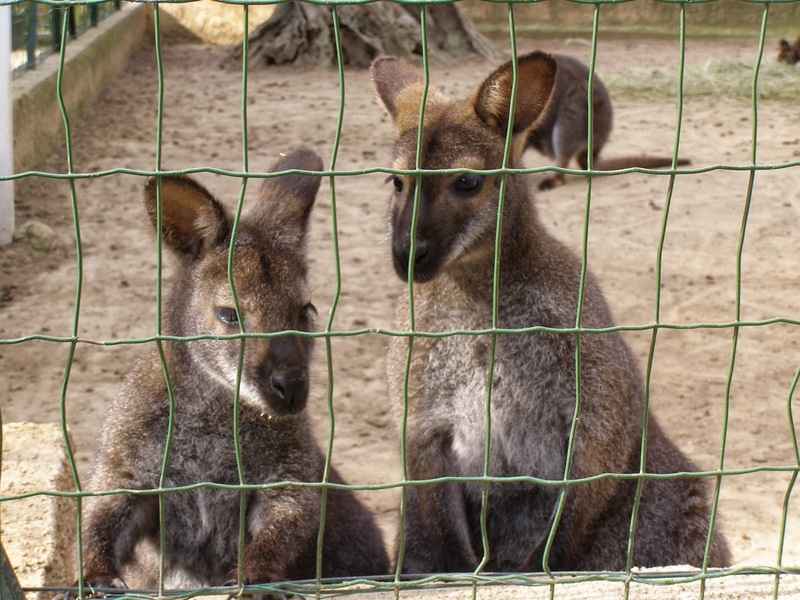 Often, we visit them in Nantes. This time, I asked if they'd meet us in Paris. They had to rearrange their schedules, because they were on their way to visit family in Nancy, France, but they stayed in Paris on Friday to meet us. Michel (the husband) met us at the train station, where we hung out for half an hour because one of his daughters was catching a train to Switzerland. We got to spend a bit of time with Isabelle who had stayed with us in Ohio before. With Michel and Danuta, we went for a walk on Isle aux Cynges. I'd read about it on Facebook and it looked lovely, but you can probably just look at the pictures and skip the actual walk. It was just a stroll on a manmade island, but it was a lovely view of the Eiffel Tower. The island, in the middle of the Seine, begins at the French version of the Statue of Liberty. I thought this was kind of a cool shot. It looks like she is just standing at the end of the bridge along with the other people. Truthfully, she's in the river. Here's Earl and me with Michel and Danuta, our friends who live in Nantes. As you can see, the walk ends with a lovely backdrop of the Eiffel Tower. It was cold here in Paris, so Danuta wrapped me in her wool scarf to help me stay warm. We also got to catch up with Henri, a boy who stayed with us in Ohio when he was 15. He's a lawyer now for the minister of defense in France and had about 15 minutes to meet us before rushing off to spend time with a friend. Nice to see him again. We had dinner with our friends and two of their children at a "typical" brasserie near Gare St. Lazare. I'll just show you a picture of the ceiling and you can picture the rest. I feel safe in guessing this was a Belle Epoque-style brasserie. 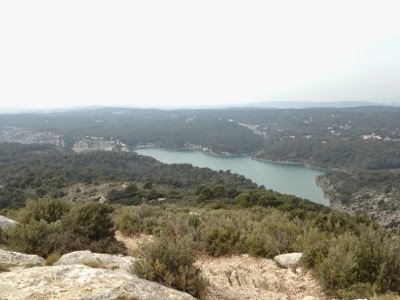 The past two days, Earl and I have been hiking in France. Other than some tricky times figuring out where a trail begins, we've thoroughly enjoyed it. Earl had knee surgery in January, so we took it easy the first day so we could go farther the second day. 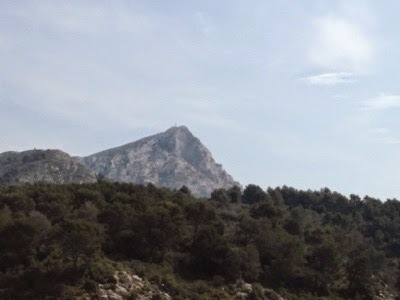 Good thing because we basically scaled the face of Mont Sainte Victoire the second day. 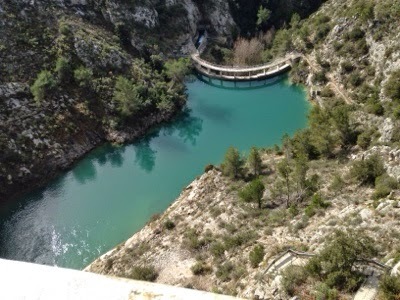 We started at this dam. We were heading here. 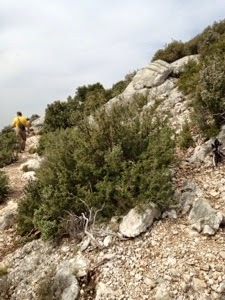 The weather was beautiful; the climb rocky and steep. There are some funny things about travelling in another country. People do things differently. One of those things here in France is that we turn in our key every time we leave the hotel. The key is no card that you slide at the hotel door. Instead, it's a metal key with a big, heavy fob on the end. We might leave the hotel and be back half an hour later, but each time we hand in our key and say, "Bonjour, merci." And the desk clerk responds, "Merci, au revoir" or "Bonne journee." We might be gone the entire day and come back with a "bon soir" before asking for our room key, "Deux cent trois." Or maybe we go outside, find a market, end up buying something and come right back to the room where we have to ask for the key again. I've always been resistant to staying in a bed and breakfast because I feel like the owners are too closely connected to our comings and goings, and the same is similar here in France. That doesn't keep me from wanting to come here and visit, of course. It's just a quirky thing that people might not know about. 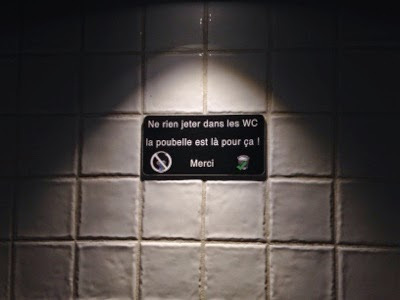 Another strange thing I've run into the past two days, are signs in the bathroom that warn people not to put anything in the toilet, including toilet paper. That, of course, can be uncomfortable. I saw that sign in Aix en Provence at the studio of Paul Cezanne. I also saw that sign when we traveled to Marseille today. Earl said the sign made sense at Cezanne's studio since it is on a septic tank, but in Marseille, near the port, it had to use a decent sewer system. We're definitely learning a lot here, and I'll throw in a few pictures that aren't about hotel keys or bathroom habits. We visited Marseille today. The train station perches above the city. That's me posing. Doesn't Earl look French with his scarf? We had lunch at this restaurant -- goat-cheese salad, penne and roquefort pasta, dessert of chocolate cake with English cream, followed by tea for Earl and coffee for me. 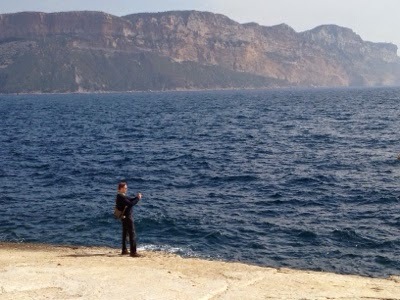 I was kind of nervous about travelling to Marseille. It was a place we'd never been and I heard a lot about crime in Marseille, but after we had been there walking around for awhile, we felt confident enough to take the metro five stops out of the old port section of the city. The metro was clean, swift and safe. We only ran into trouble when we were in a government building and went out the wrong exit, twice. A guard ended up following us to make sure we didn't break any more rules. Today we set off to explore France, in spite of the persistent rain. According to the weather, we would have a two-hour window without rain. But the weather was wrong. Nevertheless, we visited Isle sur la Sorgue, about an hour away from Aix en Provence. Isle sur la Sorgue has a market on Sundays, and has many antiques shops every day. We aren't in the market for antiques, or the lovely food products, but we still enjoyed strolling through the streets of the town. La Sorgue is a river that comes from a source so deep that no one knows what the source is, according to our friend Delana who played tour guide today. The river is a striking green color, and it isn't even Saint Patrick's Day yet. The long grasses in the river reminded me of mermaids for some reason. The town has many canals, directing the rushing green water through gates. Sometimes the water gushes, sometimes it calmly flows. And that's where Earl and I spent the day, as we pose here in front of a canal, which is mostly hidden by our umbrella. Parker. 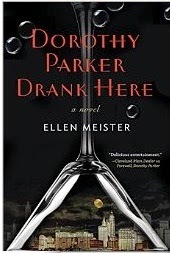 In her previous Parker novel, and this one, the idea is that Parker haunts the Algonquin Hotel where she and other authors hung out. In this book,the quipping Parker is mixed with a likeable television show assistant producer who's about to lose her job and a washed-up author who is dying of an operable brain tumor because he feels guilty about cheating on his long-ago wife. I'm really enjoying the book. Death was like a bowl of soup. At least that's how it felt to Dorothy Parker. One minute she was aware of a terrible pain radiating from the middle of her chest, and the next she was floating in a warm, brothy bath, where everything around her hovered at the same temperature as her body. She couldn't tell where she began and the world left off. I love having French friends. They teach us so much about the country we love. They give us good food and a place to stay whenever we visit. They've showed us so many fascinating things and popped the cork on numerous bottles of wine. On our upcoming visit, we aren't staying with our friends, but they are going to meet us in Paris to celebrate our friend Danuta's birthday. I have the hardest time figuring out what presents to take someone who is French when I visit from the United States. On our last visit, we hadn't planned to stay with them so I didn't take a present. When we went at the last minute, I bought macarons from Lauduree. The whole family loved them, of course, because they are French. So here's my latest idea for a present. What if I make copies of photos of our families from each of the 9 visits we shared in France? I can put the photos in a photo album and give it to her for her birthday. But I don't know. I'm too close to it. Is that a good idea for a gift for a French friend? Does anyone have some better ideas? I'm running out of time. Thanks for playing along with Dreaming of France. Please visit each other's blog so you can share the joy with other Francophiles. Dinner at my house just doesn't happen any more. Even with all five of us home this week, no one seems to be on a regular schedule. I work during the day Monday, Wednesday, Friday and in the evenings on Tuesday, Wednesday, Thursday. When I work during the day, I eat breakfast then usually don't eat until I get home at 2:30 or so. I'm always starving by then so I eat a combination of lunch/dinner. Grace may be working during the day or in the evening beginning at 4 p.m. Tucker has classes every day and usually has to go to work at 5 p.m.
Earl comes home from work in the evening, often to find everyone else is working and dinner didn't happen. The best plan would be to put a meal in the crock pot and let everyone eat whenever they want to before work or after work. I tried that with noodles and, surprise, they got overcooked and mushy. The meals I can create and leave in the crock pot all day seem kind of limited, which is why we, like many Americans, end up grabbing food out. Yesterday, I planned to make chili when I got home from work, but as I walked in and Grace ran out the door to a math class, she told me that Spencer had just woken up. He came into the kitchen, and I asked if he wanted an omelette. It was breakfast for him even though it was 2 in the afternoon. So I made him an omelette, bacon and toast. Tucker came home from class, walked through the kitchen and made a "mmm" noise. "Want an omelette?" I asked him. So I made the same meal for Tucker. No sense making chili now that I made them meals, I thought. I had just a few hours before I had to leave for my evening class. I hopped online and ordered a meal from Piada. Piada probably doesn't exist where you are, but it's like Chipotle except Italian. And if you don't have Chipotle, a piada is like a giant burrito shell with spaghetti and your choice of meat and sauce and veggies inside. I had zuchinni, mushrooms, black olives and artichokes in mine with chicken and red sauce. I thought Tucker would be set since he had just eaten, but he wanted a piada to take to work with him. When Earl got home, he had Spencer's leftover burrito for dinner, but there are still those overcooked noodles he could have chosen. What do you about meals and crazy schedules? Sometimes I wish I was one of those kinds of wives. You know the type. The ones that expect their husbands to take care of everything. I was huddled in my car at 8:30 tonight, ready to drive home from teaching. The snow was falling heavily, and my windshield wipers scraped at the ice beneath trying to clear the glass. I called home to see if anyone needed anything. Spencer, home for spring break, planned to take the car after I got home. I had been debating whether I needed to stop and get gas. I could brave the snow and get gas on the way home while the temperature hovered around 30 degrees, or I could wait for the next day when the snow would have stopped but the temperature would plummet. If Spencer was taking the car, I'd need to stop and get gas. He's a poor college student so has no money to fill up the car. Earl offered, "You could come home and I'll go out and get gas." But I couldn't. I'm not that kind of wife -- the kind who would go home where it's warm while her husband ventured out in the snow for no reason. 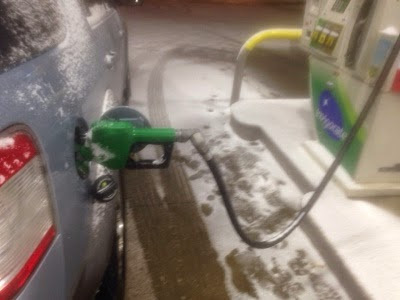 I was out already; a little snow and cold wouldn't kill me while I filled the car with gas. But Earl told me, "You can be that kind of wife if you want to." I'll keep that promise in mind, just in case I ever need it. I have a book I'm saving for my trip to France, which is only 10 days away! 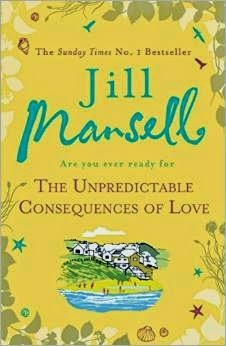 I had to order Jill Mansell's The Unpredictable Consequences of Love from the UK because it is still not available in the U.S. Mansell is a perfect vacation read, a British chic lit novel. I plan to open it on the plane. In the high-ceilinged drawing room of the Mariscombe House Hotel, Sophie Wells was putting the finishing touches to the setting for the photo shoot. The original plan, to photograph the Ropers outside and en famille in Marks and Spenceresque summer meadow, had been scuppered by the abysmal weather. The rain had been hammering down all morning and there was no way of postponing the event, as two members of the family were flying back to Australia tomorrow. But Emma Roper knew exactly what she wanted. On the phone earlier she'd said, "OK, if we can't be outside, we'll have one of those all-white shoots instead. You know, all modern and cool. And we'll all wear white too. It'll be like one of those Boden ads." Delighted with herself and her artistic vision, she'd announced, "So that's sorted. We'll see you at the hotel at three. It'll be great!" Sounds like Sophie has a job that throws her together with insufferable, posh people. I look forward to digging into it. I look forward to finding other good book ideas from everyone on Tuesday Intros. Traveling with kids is always a hit or miss experience, and most of the time both hit and miss. 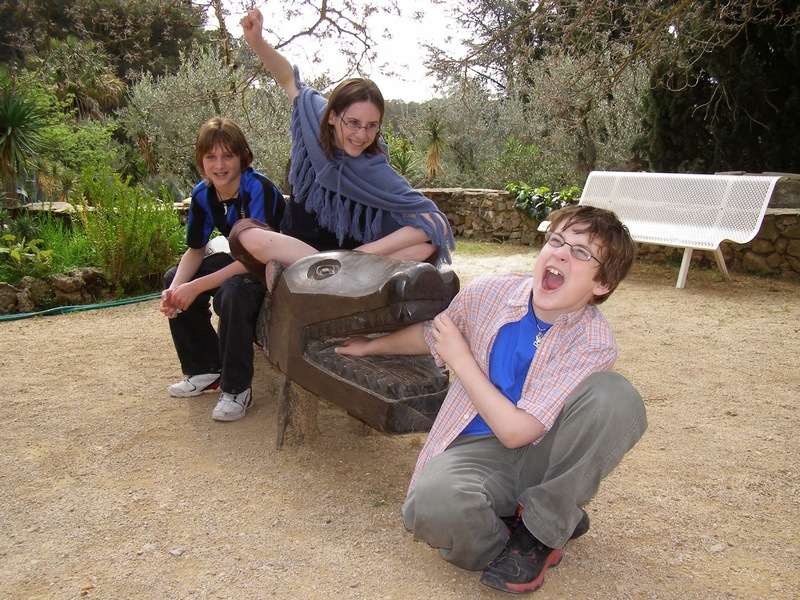 We had some brilliant moments and some excruciating ones last time we took all the kids to Europe. We always looked for things to entertain them. 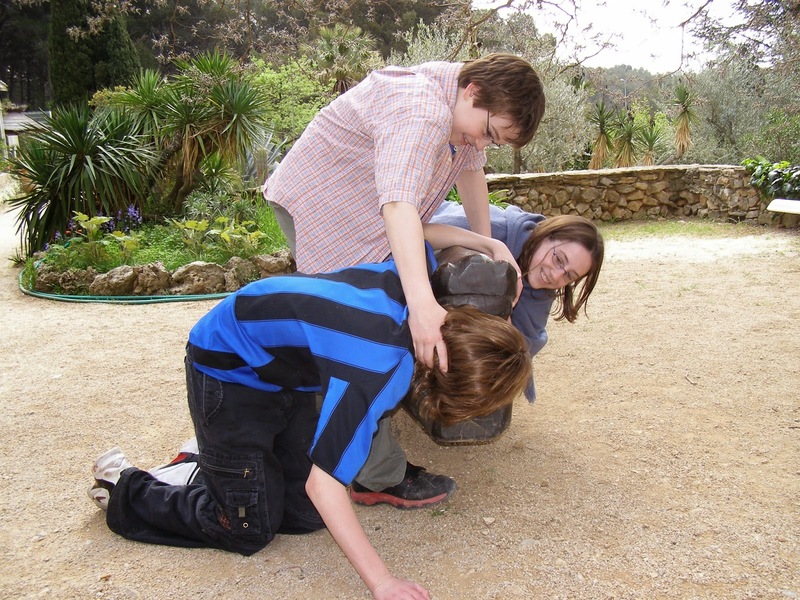 One day, while staying in Bandol along the Mediterranean, Earl took the kids to a nearby zoo. In the US, we take our zoos seriously. They're a little more laid back in France. You can buy popcorn or caramel corn to feed the animals. So the animals were anxious to greet visitors. 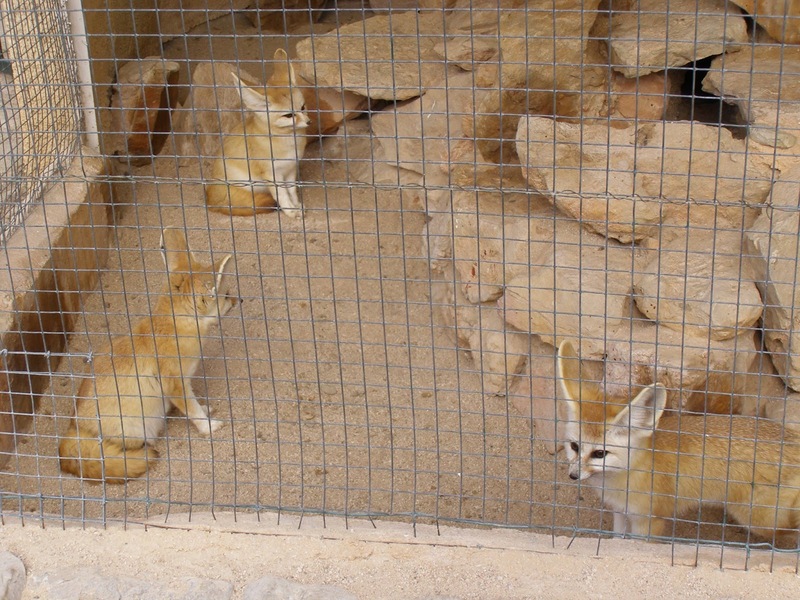 But my favorite pictures from the zoo were of my children goofing around. I love that Tucker, my youngest, was such a joker here. He had just turned 10 and could be his true self. Today, he turns 19, and he has become a serious guy without much room for making a fool of himself. But we'll always have these memories and hope the true Tucker reappears in a few years. Thanks for playing along and please visit each other's blogs and leave comments.